Whilst it is true to say that the types of restaurant now available in Amalfi have been very much influenced by the town's booming tourism industry, there are a number of traditional trattorias and Italian dining venues worth finding. With such a beautiful coastal setting and waters rich in seafood at its very doorstep, restaurants in Amalfi often feature fish prominently on their menus, although the cuisine of Campania also makes a definite appearance on many a plate. Restaurants in Amalfi not only take full advantage of the plentiful seafood, but also of the availability of many fresh and seasonal ingredients, which include tomatoes, basil, fennel and various Italian cheeses, such as mozzarella. 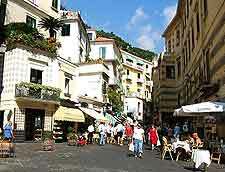 Neapolitan pizza (pizza napoletana) is a firm favourite with tourists, being tasty, filling and cheap. 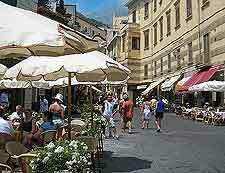 The many pedestrianised squares littering central Amalfi are well connected and home to a number of popular restaurants, cafes and similar eateries, particularly on the Piazza dei Dogi and the Piazza Umberto. During the fine weather, many of the tables and chairs are often moved outside, so that customers can take full advantage of the Amalfi sunshine and enjoy al fresco dining at its very best. A good selection of restaurants line the Via Lorenzo d'Amalfi, the Salita Ruggiero II, and the Via Matteo Camera, where the Ristorante La Caravelle is a superb Michelin-star restaurant with set menus and an impressive wine cellar. 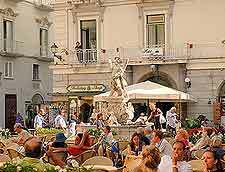 Other eateries are to be found around the Piazza Spirito Santo, or on the Via Genova, which leads on to the Via P. Capuano. Next to Amalfi's cathedral, the Piazza del Duomo also contains a number of noteworthy dining options and elegant cafes, and is conveniently just a short walk from the beachfront.